A mystery Mailbag teardown item! I have a box in the closet with a bunch of IBM circuit boards that looks similar to the ones in this device. Same metal can covered chips and boards with a grids of square pads. Guess I'll have to dig the box out and take a look, and maybe post some pictures. Apparently this thing is a "Floppy Drive Maintenance Device." Too late to make xmas lights from them! I believe the boards with the metal cans make up IBM's Palm (Put All Logic in Microcode) Processor. This website has a whole bunch of information and pictures detailing the various boards as well as those metal cans (Bipolar gate arrays). Thanks for that Dave, very interesting. Perhaps you could turn that LED display into a bedside clock or have it scroll some stuff or something? Is that a glimpse of the new meter we see near the end? IBM made those boards with multiple ground and power planes in them, thus giving a very low impedance power supply for the logic, plus the capacitance of those boards meant they could get away with only a few bulk capacitors per board. There are 3 pin decoupling capacitors though, and 4 pin as well, which have a ferrite bead on the incoming power side, a built in tantalum bead or ceramic chip capacitor and then a load side. The chip looks like those black resistor arrays, just 3 or 4 pins wide, and is moulded IC resin. The reason for all the pads is so you can always connect to internal nodes, or do layer changes inside, and have full bed of nails test access to the board, with or without components on it. Thus a production change, or a version for a specific application would likely have a modification done, either drilling out a pad to isolate a trace, then use a jumper wire to move the trace, or like here to fix a fault detected after assembly. As the parts are all IBM parts ( down to the screws, the labels and even the lacing twine, which probably was still a part number from Apollo days) and all the tools are IBM part numbered, they had very little issue with reverse engineering, as non original parts would stand out glaringly. They even had entire hardware tool sets designed to fit IBM screws, bolts and nuts perfectly without marring the finish. You thought flip chip is recent, those aluminium cans are a combination of flip chip, with a solder bump on the die to make contact, and beam lead transistors and diodes, along with SSI chips, resistors ( there are resistors in the smaller cans, especially those with lower part numbers, which may even date from the 1960's when they started making them), capacitors and multilayer ceramic traces, made so they could make a reliable sealed package. They were common, even though the stock might have ranged in complexity from 5 transistors in one to almost a full processor. All encapsulated internally with Parylene, that soft transparent coating, so they would still be reliable even if the hermetic case was compromised. I had forgotten about those. The Land Grid Array reference is almost certainly unrelated to this thing. That's the name Intel uses for their sockets (hence LGA115x or LGA2011). It's a general socket type, not specific to Intel. AMD uses LGA in their C32, G34, etc, sockets, mainly for servers. the video at 18:45 matrix displays. good idea Dave, those matrix displays need reviving, So when you're done with the nixie project. I would like to see a classic digital display racks or wall in the lab. as lab background, or video set backdrop. It seems these boards are related to an IBM tech called Solid Logic Technology (SLT). It's very old tech dating back to the 60s, but seems like an upgrade of the previous IBM tech called SMS. The idea is the same - making reusable blocks that could be plugged together easily, what would later become ICs. These blocks were mounted on ceramic plates which were then mounted on the grid PCBs. You can see some examples in the wiki article. They look a lot like the one Dave decapped, but simpler. Now, all the resources I can find only talk about these ceramic blocks, it doesn't say anywhere why the PCBs were made as grids. I think it's possible the boards were manufactured like that to save on pad drilling time. Instead of drilling holes one by one which would require time and setup costs, they probably just punched them all at once in the regular pattern. It's also interesting that 60s tech would be used in something seemingly manufactured in the 80s. I've got some of those smart led displays from TI. Used them in the 80's. Interesting that IBM made this unit in small numbers but still U.L.-ed it. Not really, these would have been used in large installations, and they would require all equipment that is used there, from the concrete in the footings, to the nails in the roof, to have a UL or other certification that it meets safety standards. Likely for IBM it was easy as well to simply send the first unit ( seeing as the one Dave has is number 2) for certification, and then use the number. Also likely is the number is for the standard IBM small power supply used in the unit, which would be the part most needing certification for mains connection, and providing protection against faults in the rest of the device causing damage. I went to my first year of college at Vassar in Poughkeepsie. My family had a house about 20 minutes from there in Poughquag. I learned to sell well early on. These are native american names. Although IBM's corporate HQ was not far away in Armonk (dutch name), Poughkeepsie was where they built their mainframes at least in the IBM 360 days but probably after as well. I visited the assembly line where ladies made core memories in fact. There was a jig for the XY part but the sense line was literally put in by hand with a needle. I had access to APL 360 on one of the first time sharing systems. Look up that language - it was weird and strange, unlike any other. It's pronounced Poke-Kip-see. The city is on the Hudson river about 2 hours north of New York City. Armonk is about half way. Poughkeepsie is in Dutchess County and about 40 minutes south of Hyde Park, the home of President Franklin Roosevelt. Woodstock, of rock concert fame was a similar distance, a very happy thing for college students but possibly too happy. Yes please do something with those displays! They look awesome. Back around 1971 NCR, "National cash Register" made an infomercial showing how they made core memory. The memory card was on a shaker table and the cores danced across the card until they fell into blind holed in the card. No pick & place needed. The HP9825 used those displays. The early 9825A had a "chicklet" keyboard, and red tinted encapsulation on the LED part. Since they already used a red window, they switched to a clear encapsulated LED display in later A models and the 9825B (not to mention a proper keyboard), to improve the overall brightness. They are pretty simple devices. Rows are selected by a 28 step serial in-parallel out shift register. The 5 columns of each of the four characters are all tied to 5 external pins. Pardon the message on my HP9825's LED display... I was trolling some conspiracy nutters online the day I took that picture! Wow richfiles, I used that calculator in 1976. I used to work for IBM in the late seventies and early eighties doing electronic repair on all types of IBM systems. The unit that you have was indeed used for mainframe diagnostics back in the day. And yes, we had a number of these suitcases in New Zealand so there would have been a lot of them made. I never worked on mainframes so I never used one of these but I did repair a couple. Field Engineers would often shut the case, with the diskette still inserted, and bend it over. Not a great design! The diskette had all the code (Microcode in IBM speak) to boot up the device and get it functional. From distant memory, the display should show an error if the diskette was not inserted on power on. Thats about all I can remember about the unit but I do know a few things about the grid PCBs. It is multilayer, four layer at least, with plated through pads at 0.1" everywhere. I think that IBM must have had a process to make them that could easily have the traces added where needed. So you could place chips and passive components anywhere on the board and use all the other holes as vias. Bypass capacitors, when used, where typically single caps (Not arrays). They where pretty much the same size as the resistor arrays but only 2 pins long. The big silver aluminium cans.. We called these 'Duchess Modules' (Their code name. Everything in IBM had a code name.) They were always through hole (I know as I have desoldered thousands of them.) They came in different pin configurations depending on the number of wires that the chip needed. There were literally hundreds of different types. The IBM PS/2 (1987) even used them. The smaller cans had different configurations too. Sometimes they where as simple as just containing four transistors. 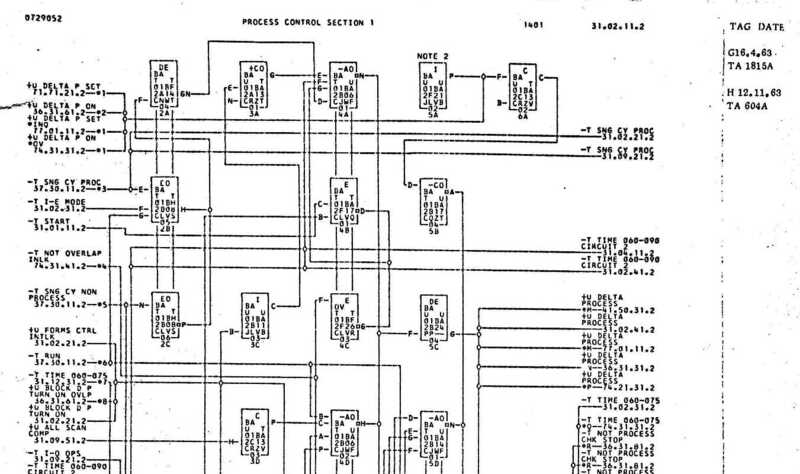 And finally for those who want a blast from the past..
IBM created circuit diagrams of their equipment using line flow printers (No graphic laser printers back in the 70s and 80s.) These massive printouts, called Automated Logic Diagrams (ALD) where a site to behold. It was really easy to bump the lid closed while working around the device. I usually used my largest screwdriver to prop the lid open. It saved me several times. So I dug out that box of old parts from some IBM equipment. After all these years I don't remember what it was that these boards came out of. But they show the same style of construction as the piece of test equipment Dave tore down. Metal can modules, DIP ICs, and discrete components in a board with a grid of square vias with fine traces routed between the rows of vias. Traces look autorouted, as nobody would do these types of paths by hand. It seems there were rules like no T connections on traces. Three way trace connections are always done with one of the square pad vias and the traces all connect to separate sides of the via. Traces are also routed close to pads even when not necessary, as an autorouter would do to save space for future routes. The boards I have appear to be multi-layer. If you put one over a light you can see light around each of the grid vias. They also appear to possibly be coated on the outer layer with something that contains tiny air bubbles. But none of the grid vias are coated - you can see the coating dip down and end around each of the square vias. 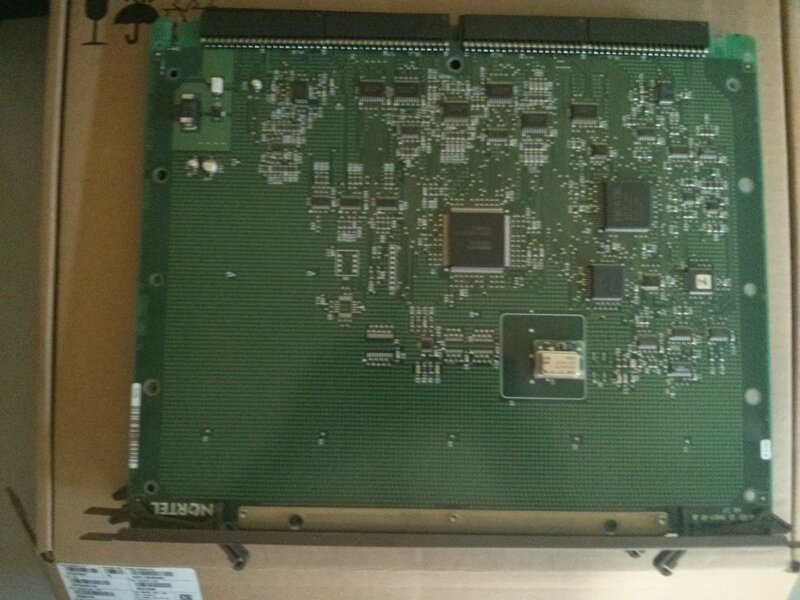 I will attach pics of a couple boards. One large one with connectors in plastic bars down the sides, and a smaller one. Also a shot of the large board lit from below so you can see the gaps in the internal layer around the grid vias, and a couple shots through the microscope of some of the strange trace routing. I might have to do a YouTube video on these boards. And here is the smaller board and a couple microscope shots of the trace routing. They also appear to possibly be coated on the outer layer with something that contains tiny air bubbles. That coating is the solder mask. What you're seeing as bubbles in that layer are, I think, the junctions of the warp and weft of the underlying fibreglass rovings inside the board. Don has a better memory than me. Dave, Dave, my memory is going. The reason that you won't find tons of bypass capacitors is that these things worked at a snails pace compared to modern equipment. 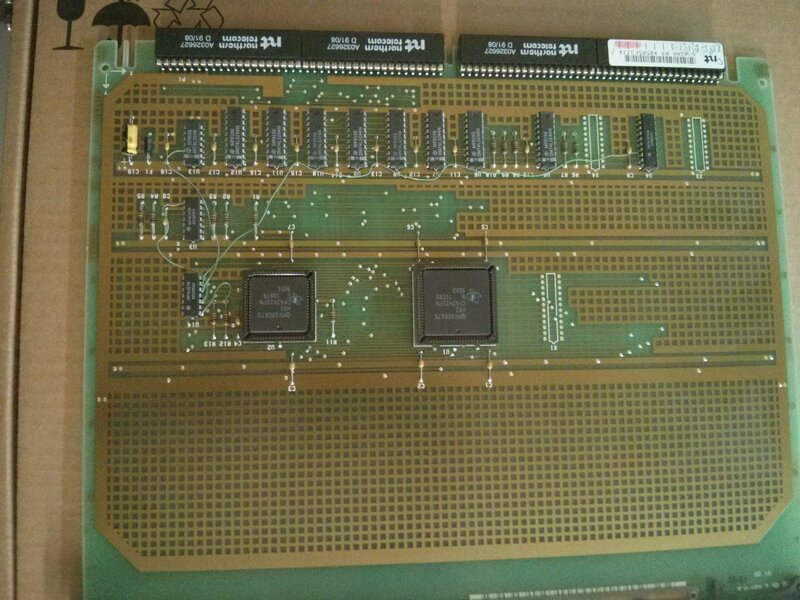 And they seemed to be very well designed, even if you don't like the grid PCB arrangement. All the DIP chips will be IBM part numbered 74 or 74LS series 'Jelly Bean' chips. It was very rare to see a standard part numbered chip back in the day. Even the likes of 741 Op-Amps would be IBM part numbered. Engineers also had IBM part numbered Fluke multimeters, Tektronics scopes, Snap On tools etc etc. There was a very specialised inventory control system, that Don will remember, called CEPICOS (Customer Engineering Parts Inventory Control On-line System.) that managed stock of millions of parts for IBM locations worldwide. And as noted, all the grid holes in the boards are filled with solder. I imagine that the components were installed in the correct places and the board wave soldered, thus filling up all the unused holes. They would have had another machine to solder on the spring contacts for the end connectors. Having had to replace munted contacts manually, it is a pretty precise job and hard to do well by hand. I don't know of a chip list of IBM part numbers to standard chip numbers, but someone on the net should have one. BTW. At one point IBM was the largest manufacturer of silicon chips in the world. Move over Texas Instruments, but alas no longer. But as IBM used its own silicon and never sold it, it was never widely reported. Ah, the PT2... and the switchbox with the rows of switches and LEDs used for 3271 and other control units. What a wonderful Christmas present! Well before commercial EDA tools were available, IBM had an in-house EDA group (this was the group I worked in most of my career) that wrote their own schematic entry and synthesis systems, logic simulators, transistor-level simulators, test pattern generation tools, static timing analysis, chip place and route, you name it. And this was LONG before any of the 3rd party tool vendors existed. And like Alien posted, at least prior to the late 80's, these all ran on mainframes accessible via terminals with very limited graphics capability. Everything was driven by esoteric text files with a zillion three letter acronyms in addition to ALD. This was all for chip design, but I suspect the board designers had similar technology. When you are limited to designing on a more or less text-based display using very primitive (by today's standards) layout and routing tools, it's no wonder you'd wind up with that grid-based board design technique. 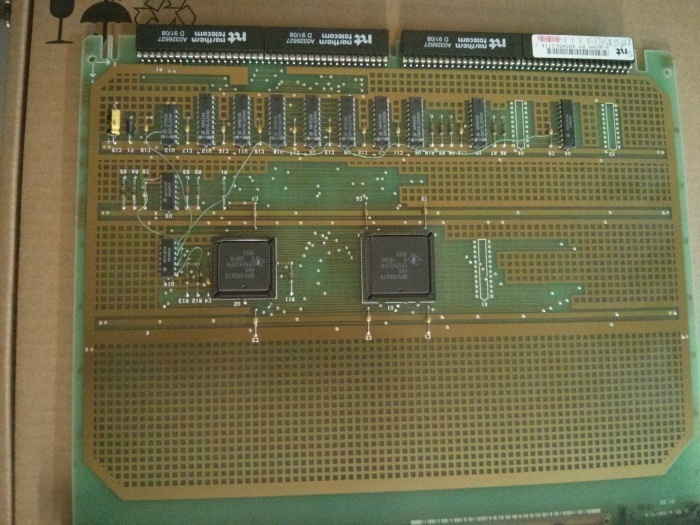 My first job at IBM was working on one of the first truly graphical EDA environments (at least for chip design). It still ran on the mainframe and was originally written in Pascal, but it did use a 5080 graphics terminal. A few years later we ported it to the RS/6000 UNIX environment. This was a little after other EDA vendors were starting to have legitimate offerings on Sun, Apollo and HP machines, so we were somewhat behind the times, but most of the IBM design community was still running on mainframes. The IBM EDA group continues to this day and certainly has its niche areas of expertise. Cadence's Encounter Test tool is based on an IBM test tool and still has "hidden" IBM environment variables that are used for certain IBM proprietary uses (nothing outrageous, just turns on certain output formats used by custom IBM chip test equipment), and IBM's static timer is state of the art, albeit not really industry compatible (IBM's solution is the "Beta" to the industry's "VHS"). But once IBM sold its chip manufacturing business to GlobalFoundries in 2015, I wonder if the EDA group is sustainable. One last comment to add: at 5:56 IPL = Initial Program Load (what we would call a "boot" today). That grid style kind of reminds me of how DMS cards are made. There are different styles too, some have an actual grid (ground plane basically) while some have the regular dots. I worked with those types of boards for 7 years (first job out of uni) on mainframes and other equipment, at IBM. The diskette drive sensor is not a track sensor. It is a hole sensor in the drive that detects rotation. To be more exact, it was called a LED/PTX assembly, meaning LED and photo transistor assembly. The PCB's of course were multi-layer, typically 8 to 12 layers. Hence the routing complexity was not difficult, especially for the autorouter. The DIP ICs in the plastic packages were not custom IC's. They are standard off-the-shelf IC's that were relabelled with secret IBM codes. There were a number of reasons to do this, one being IP security. Those boards were likely reused from elsewhere. They are unlikely to be custom boards. and the pin numbers in each connector side was 2 to 13. Pin 1 did not exist in the connector. These boards were quite expensive, as one could imagine. They were generally very reliable. The biggest problem with them was ESD. The CMOS was particularly very sensitive to ESD. The ESD may have been caused in manufacturing or packaging (latent failure) or by a service tech not handling them with the correct ESD procedures. These boards occupied machines such as the System/32, System/34, and System/38 and a host of others. Regarding the routing, the right angles were fine. Make no mistake, IBM has well ahead of the pack with their PCB manufacturing technology. They had no issue with etching near the corners. Most raw cards were made near the corner of Braker Lane and Burnett Road in the Balconnes area of Austin Texas, which is now a park area (not residential) due to the toxic materials that have leached into the ground. I worked next door at the IBM PCA plant on assignment, but I managed to toured the PCB plant back in 1992, courtesy of the plant manageress of the PCB plant. 1. Sharp corners might invite arcing on higher voltage circuits or when an ESD spike hits. 2. They look crap. PCB layout should be impressive artwork. It looks like you've done a cheap job on a PCB. No science to it, just aesthetics. You won't get impress the chicks with 90 degree tracks. It looks like painting your fence in Mission Brown. Pride in PCB layout show the work of a craftsman rather than the average tradesman. There is some argument about EMI. For differential high speed signals, I don't believe there is much difference between 2 x 45 degrees, or 1 x 90 degrees per track OVERALL; as long as the impedances are matched, the electrical lengths are the same etc. I don't like right angle buses in schematic layouts. This is for a practical reason. The right angle on a bus entry or buss bends for example, "points" to the direction of its connection at the other end. Right angles do not do this. Furthermore, a poorly printed schematic is easier to decipher with 45 degree connections rather than right angles. (I hate round dots for pin 1 marks too in PCBs. Triangles are a lot smarter, for practical reasons.) IBM's computer generated schematics were below par in my opinion - bloody hard to follow. They never used standard logic symbols for a start; just "logic blocks". IPL is IBM for boot. =Initial Program Load. I did my degree placement on IBM system/36 midrange computers. I also had a System/34, which I kept in my pairents garage as it was the same size as four, four draw filing cabinets. (this beast was retired from my fathers company and I got it to learn and play with. It was stuffed with cards just like in the video.